This information is intended for families new to the Independent Study (IS) Program, or families moving from the younger IS classroom to the older IS classroom. This is intended as a nuts and bolts document to help put the many pieces of the program together and answer common questions all in one place. The Independent Study (IS) program offers two dynamic, multi-age classrooms that meet 3 days per week. Children receive classroom instruction with a math and writing focus and participate in various enrichment programs. A certificated teacher and parents/guardians teach one-to-one, in small groups, and to larger groups. Pacific Elementary School District understands that children learn in diverse ways and the individual needs of each child are carefully considered. The District recognizes the value of offering an alternative to classroom instruction for families that prefer a home study program, but also desire consistent structure and curriculum, and regular interaction with qualified teachers and other children. In an effort to respond to each student's needs, Pacific School District is dedicated to designing and providing a unique program where families, staff, and administration work together to strengthen student achievement and the joy of learning. The parents, guardians, or caregivers of pupils requesting independent study should recognize that independent study at the elementary level must emphasize a commitment and dedication on their parts. The unique IS program holds class on Mondays, Tuesdays, and Thursdays. Kindergarten meets from 8:40 to 12:30 p.m.
Kara Nickel teaches kindergarten through second grade, and Terra Barsanti teaches third through sixth grades. The teachers collaborate and coordinate schedules so that students may travel between the two classrooms as appropriate for their learning needs. The IS program follows the regular school calendar, with the following exceptions. The first classroom day for IS starts on the first Tuesday after Labor Day. The school year before Labor Day is used for orientation meetings, parent-teacher start-up conferences, etc. IS students participate in the last day of school activities if it falls on a Wednesday or Friday. Even though the 5-day program observes some minimum days each year to accommodate parent conferences, these minimum days do NOT apply to the IS students and families. The classroom portion of the program focuses on two core subjects, writing and math, which usually occupies a large portion of the day in both classrooms. However, this is dependent on whether there are enough parent volunteer teachers to address all ability levels. IS students participate in science, social studies, art, music, Life Lab, and other parent-led classes. These additional subjects can vary year to year depending on school funding and parent interests and strengths. Students in 3rd through 6th grades participate in the CAASPP assessment program and other state or locally mandated assessments, which typically requires attending school a few Fridays in May. Families should plan to have their students regularly and consistently attend the classroom portion of the program. IS students are expected to follow the same standards for attendance as other students at Pacific Elementary School. If a student is absent for more than 10% of the classroom days (11 days per year) for any reason, including home schooling, an evaluation will be made to determine whether independent study is an appropriate placement for this student. This attendance expectation applies to all students, regardless of academic progress. This program is not designed to accommodate prolonged or frequent absences from school, as such absences detract from the sense of community and the ability of the student to participate in ongoing lessons and projects. That said, in order to take advantage of unique travel or other opportunities, families may choose home study for their students instead of send them to the classroom program. Families must communicate with the classroom teacher in advance about anticipated absences, and such absences must be limited and occasional. As stated above, students should not miss more than 11 classroom days in a year for all reasons combined. The program is entirely dependent on parent volunteers, and could not function effectively if families did not volunteer. To build community, tap into diverse talents, and spread the tasks around, each family is asked to provide an adult volunteer an average of three hours per week/per child, typically, but not necessarily, in the classroom. While parent volunteer time is greatly appreciated and key to the success of the program, it is not a requirement for enrollment or continued participation in IS. Although parents volunteer for the school in many ways and formats, the most typical is that the volunteer attends class one day each week, serving either a morning shift from 8:40-12:00 or an afternoon shift from 12:00-3:00. During their shift the volunteer teaches a small group of students a core subject, such as language arts, math, science, or social studies. With the help of the classroom teacher, volunteers design student activities, assign homework, etc. In addition, the volunteer assists the teacher with other classroom activities, administrative tasks, yard supervision, and lunch setup. At the beginning of the year, volunteers meet with the teacher to discuss their strengths and their teaching and schedule preferences. Parent volunteer service greatly enhances the students’ educational experience in multiple ways, including increasing parent-teacher communication and building class-wide community. Therefore, it is generally preferable if a parent or guardian can volunteer in the classroom. However, it is also possible for another family member or a paid tutor to participate in the classroom if it is necessary due to particular family circumstances. Siblings who are not enrolled in the IS program may not accompany classroom volunteers. Kindergarten IS students should not accompany parents who volunteer in the afternoons. Instead, they may be enrolled in the school’s After Care program. There are many ways to volunteer for the school and the IS program in addition to the classroom help described above. Families should think about their own strengths and interests and work with the teachers and the greater school community to find ways to volunteer which serve everyone well. Some examples: Library, site council, parent’s club, prepping for classroom activities, computer and scheduling skills, field trip/bus/email group/volunteer schedule coordinators, fundraising, etc. See more information under Parent’s Club below. Classroom volunteers are asked to arrange their own trades if they know in advance that they will not be able to be present during a scheduled time. Families take turns bringing a nutritious and healthy snack for their entire class. Examples of appropriate snacks include: fresh or dried fruit, nuts and nut butters, cheese, hard boiled eggs, low-sugar muffins, biscuits, whole-wheat crackers, rice cakes, popcorn, celery or apples and peanut butter, carrots, sugar-snap peas, kale chips, etc. Things to avoid include: all beverages (the school provides filtered water), desserts, candy, sweets, anything with trans fats, and meats (some students are vegetarian). Gluten-free snacks are desirable, as some students often have allergies, but not required. A parent volunteer may be asked to create the snack schedule in each classroom. Parents are asked to arrange a trade if they know in advance that they will be unable to provide snack on their scheduled day. Stephanie Raugust created Pacific Elementary School’s award winning lunch program, which is now run by Emelia Miguel. Ms. Emelia incorporates the 5th and 6th grade students in a dynamic FoodLab that consists of cooking instruction, menu prep, and service. Lunches are prepared fresh daily and are nutritious and tasty. Participation in FoodLab is optional for IS students. A vegetarian option is always available and the kitchen makes accommodations for allergies and other dietary restrictions. Families pay for meals in advance at the school office if they plan on eating school lunch. Free and reduced price lunches are available for students who qualify. Students may also bring lunch from home. ​Qualified families are asked to PLEASE apply for and receive free or reduced price lunch. Increased participation in the free or reduced price lunch program does NOT hurt the school’s finances and improves the school’s chances of qualifying for various grants and other programs. Parents, siblings, etc. may also purchase lunches either the day of or in advance in the office. Around the first of each month, families should stop by the office to pay all outstanding bills. Lunch is a valuable part of the day and is included in the required daily instructional minutes. Students and teachers converse, practice table manners, and take responsibility for cleaning up. During this time there is also a focus on educating the students (mostly in the upper grade lunchroom) concerning food, nutrition, and culture. Home school time is an essential and required part of the program. Successful IS families have taken many creative approaches to fulfilling the home school part of the program. However, repeated experience has demonstrated that families who are unable or unwilling to engage in some form of consistent, supervised home school time, do not succeed in the IS program. Families and teachers meet at the beginning of the year to sign the Master Agreement, and then about every 6 weeks to turn in documentation packets, discuss student progress, and plan for the next 6 weeks. Teachers offer materials, textbooks, workbooks, online resources, curriculum ideas, and training to interested families for the home study portion of the program. Dictation (for younger students) of student stories or responses to questions, transcripts or notes about discussions, etc. Copies of books and resources used (or covers/title pages), sheet music, activity guides, etc. Brochures, signed attendance reports, etc. for classes and programs attended. For each 6-week time period, the work that is documented in the 4 areas of language arts, math, science, and social studies should represent approximately 5 hours per subject for kindergarten (20 hours total) and 6 hours per subject for 1st – 6th (24 hours total). Families who fail to provide the required documentation of home-study hours will be removed from the program. There is at least 1 parent volunteer field trip coordinator for each year, ideally one from Upper and one from Lower IS. These field trips are scheduled for approximately three Fridays per month. All field trips are optional. Families are encouraged to participate in the field trip program as their schedules allow, as they represent important educational opportunities and facilitate community building within and between the IS classrooms. In order to share the workload and ensure a variety of field trips, each family is asked to organize one (or at most two) field trip during each school year. Returning families and the field trip coordinators serve as resources for any family who is concerned about organizing a field trip. In addition, there is a binder of field trip ideas in the upper IS classroom. Most families find that organizing a field trip is not especially difficult or time consuming. However, we understand that ocassionally a family’s schedule will not allow them to schedule a field trip. There are limited school funds available for transportation, entrance fees, class fees, field trip scholarships, etc. The field trip coordinator and the school office will have the details. Families can be asked for a small donation, approximately $5-$10 per student, to cover the cost of a field trip. Field trip funds can be used to offset costs of more expensive trips. Any family for whom the cost of field trips is burdensome or prohibitive should speak with the field trip coordinator about field trip scholarships. All students participating in field trips should have a designated chaperone for each trip. The students should know who is their chaperone and the chaperone should know which children for whom they are responsible. Families and siblings are generally welcome on field trips, if they are appropriately supervised. IS students who participate in field trips should provide documentation of their participation and learning to submit with their packets. Trip organizers should plan and facilitate documentation. Families are welcome to network and generate carpools. Families who participate in carpools of any kind should make sure that the names of ALL adults authorized to pick up their child from school are on file in the school office. A city bus runs from Westside Santa Cruz to Davenport at a convenient time to bring students to school. The bus is free for students under 46 inches and costs $2.00 per trip otherwise. Various bus cards and passes are available from the Metro Center. Families, especially of younger students, take turns riding the bus with the students as a bus chaperone, and walk the students from the street to the school. Bus chaperones can catch the return bus into Santa Cruz a few minutes after dropping the students off at school. There is a parent volunteer bus chaperone coordinator. School Board Policy specifies that all programs available to 5-day students are also available to IS students. IS students provide the same enrollment, health and emergency forms as other Pacific Elementary School students to the main office. Optional for IS students is our Instrumental Music Program for 4th, 5th, and 6th grade children. They have the opportunity to study either marimba or a string instrument (violin, viola, or cello). For IS students, this requires a commitment to attend weekly morning lessons on Wednesdays and possibly stay for orchestra that day from 12:45 to 1:30. Participation in the Pacific School Orchestra and regular music recitals gives young musicians the opportunity to play together and showcase their skills for family, school staff and peers. 5th and 6th grade IS students participating in the Wednesday music program also participate in FoodLab on Wednesdays (which is preferable). Those 5th and 6th grade students who do not participate in the Wednesday music program still have the opportunity to participate in FoodLab on the other days of the week. IS students are welcome to participate in Pacific School’s after-school programs. Many IS students participate in chorus, which is taught on Thursday afternoons. In addition, daily after-school care is offered in two forms. “After Care” is available from 12:30-2:40 for kindergarteners. “Rec” is available from 2:40-5:30 for students in 1st through 6th grades. The two programs have different fee structures. More information on all after-school programs is available here. The school office publishes a school-wide memo which includes important information relevant to all families, including IS. Everyone is encouraged to read each memo promptly to stay informed about school-wide events, news, and procedures. Communication among IS families is facilitated by Google group email lists and traditional family contact lists. There is a parent volunteer email group facilitator. Group email lists should be used for IS-related information relevant to everyone who will be receiving the email, such as field trip, bus, and other logistics. Communications between individuals, with teachers or administration, of a more complex nature, or not directly related to the IS program, should be conducted by personal email, phone, or face-to-face. Information pertinent to all members of a class should use that class’ Google group. Information relevant to a sub-group (such as the 4th grade math group) should be sent only to the relevant families. Information relevant to both classes, or of a general nature and not specifically relevant to the program (such as, “I’m going to the park, anyone want to meet us there?” or “Does anyone have any snow pants we can borrow?”) should be directed through the IS Community Google group. Pacific Elementary School is committed to addressing issues effectively and maintaining open and high-quality communications. Families are encouraged to share questions, suggestions, or concerns directly with the relevant people, teachers, or administrators. Parents’ Club (officially the Pacific School Foundation) partially or fully funds many of the programs that make Pacific School unique, including Life Lab, classroom aides, the school library, instrumental music, drama, and art. These programs benefit both Independent Study and 5-day students. Parents’ Club relies on sufficient participation by Pacific School families each year to conduct its fundraising activities and maintain these programs. Most years, there are many vacant volunteer and officer positions in Parents’ Club, and dynamic, valuable programs remain unfunded. Friends of FoodLab is a separate organization which supports our amazing FoodLab program. Friends of FoodLab sponsors a major Farm-to-Table fundraiser dinner each fall, as well as other minor fundraisers during the year. 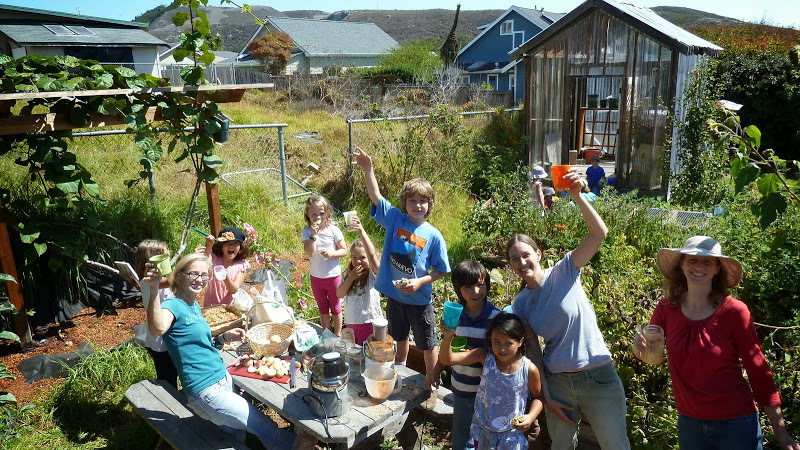 Pacific School asks all families to contribute significant volunteer time, financial resources, or both to Parents’ Club and/or Friends of FoodLab to support the educational programs that make Pacific School a rich and varied learning environment for its students.